Cycling has long held a symbiotic relationship with art. The poetry and pain of the sport inspires artists working with almost any media. From the early days of flighty prose to sell newspapers, through books endeavouring to describe its suffering and salvation, to the cinematic art of Jørgan Leth, cycling has few rivals, in the sporting world at least, as a source of inspiration; even musicians are inspired by the humble bike race - none more so than Kraftwerk. Finlay Pretsell joins this long tradition with Time Trial, his exploration of David Millar’s life in cycling, and his final season in particular. As the trailers finally finish, the first thing that confronts the viewer is the BBFC certificate... 18. What? For a film about cycling... why? Seconds later, it becomes obvious why this is an adult film. Millar, and those around him, don’t censor themselves. Why would they? This is a brutal sport, and the film contains many brutal moments. Races and riders are fucks, shits, and, on one memorable occasion, glove-stealing cunts. That’s not to say that there is no beauty in this brutal world. Pretsell obviously has a wonderful eye for the tiny moments of wonder, and shot after shot, whether capturing suffering or glory, is beautifully produced and edited. Although the influence of other artistically-minded sports documentaries is at times apparent - films like Zidane and Senna, not to mention Leth’s oeuvre - Time Trial is a unique, modern film that feels as though it could only have been made now, with a rider like Millar in total cooperation. Time Trial is more than just a pretty face, however. Nothing this beautiful has any right to be so informative... I have consumed cycling media in all its forms for many years. I’ve watched, read, listened, and streamed, not to mention raced, but I’ve rarely felt this immersed in the world of professional cycling. From tiny vignettes within the peloton, to bare-all hotel room footage, and warts and all interviews with the man himself, Pretsell gets deep under the skin of his fellow Scot, at times even to Millar’s evident discomfort. Parts of the film make genuinely uncomfortable watching. A lot of this is down to the sound design and score, which use atonality and dissonance to unsettle the viewer and underscore Millar going deeper and deeper within himself. In particular, a wickedly tough climb at Tirreno Adriatico, and the frozen and washed out 2015 Milan-San Remo are stark antidotes to any Sunday rider who fancies the life of a pro. The darkness is both literal and metaphorical - at his lowest ebb, Millar the cyclist is entombed within tunnels as Millar the man, shot against a black backdrop, bares his soul. There is no easy redemption here and Pretsell won’t allow us the simple ending of Millar punching the air. His is a cleverer and deeper film than that, and is all the better for it. Having been so deeply immersed in the peloton, finally we are allowed to come up for air… and given the narrowest of hints that perhaps there is life, and maybe even happiness, beyond cycling. Time Trial is in cinemas now, and is also available on iTunes, Sky Store, Amazon Video, or Google Play. Sometimes it's good to be questioned about what you do and why you do it. The voicing of an opinion gives one the opportunity to revisit/reassess the worth, the merits and ultimately the initial motivating force behind what you had set out to achieve. Back in March 2013 when we launched Simpson it was based on the desire to communicate and share our love of cycling with other cyclists. Honesty and a sense of community inspired us to create a no bull***t publication about the sport we dearly love. When Derby based creative content agency Crocstar got in touch wanting to interview us for their blog post we were, in all honesty, a tad hesitant. Things like this happened to more mainstream publications and not to us - but having discussed its merits we agreed it instinctively felt right. Crocstar's previous blog posts demonstrated a degree of both sensitivity and intregity that sat comfortably with us. We would like to personally thank Crocstar's writer and content creator Shannon Watson for her crafted words they beautifully capture the essence of Simpson and all that it stands for - chapeau to you! For a post 90's generation bands like Tears For Fears, Depeche Mode, Joe Jackson and now even Devo are a foreign language, a mysterious entity locked into the bygone era of their parents. For those of us privileged to have grown up with the eclectic sounds of electronic music it's amusing not only to revisit such songs but to see how they are being presented to another generation. It got us thinking, if we were to identify a song and associate it to us, which 80's song would it be? What could truly sum up Simpson, not only as a publication but as a whole philosophy? What would our choice be based on? Would we go down the well-trodden path of a cycling related song title i.e. Queen's 'I want to ride my bicycle' or should our search go deeper. Cycling like music is located in a place very close to our hearts (yes we'd better believe it - we are very passionate about both these subjects in our lives). It's the beat, the rhythm that motivates us, a slow love song isn't for us. What sound would identify us, tie us in to what we do and believe in? Kick against it as much as you like but musically the 80's was a hotbed of contrasting styles. Having gained inspiration from Big Country's album 'The Crossing' for our Romance of the Road feature in issue 11, we would look to Sheffield for our choice of soundtrack. Directly related to the manufacture of steel, Sheffield also produced a host of pioneering electronica bands like Cabaret Voltaire and The Human League. The emotive power and rawness of this track remains ideal for turbo/roller/zwift workouts as well as staying in the mind on longer rides. It's a fitting cross over anthem to both the past and future. Earlier this week we were invited to take part in an interesting art and design project at Middlesex University. The project, called I Am A Magazine, invited a group of art, design, photography and fashion students to create something interesting on the theme of magazines. 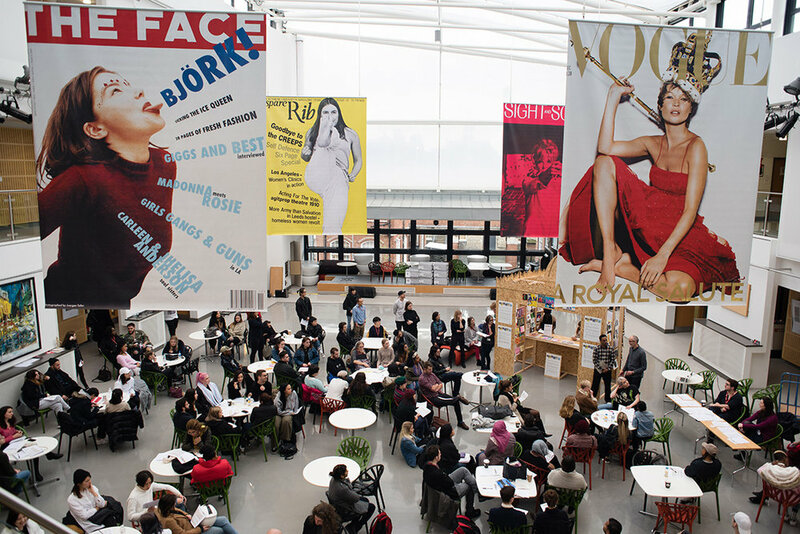 One of the ways the organisers came up with to help the students find inspiration was to line up a number of guests – including us – to give talks about various aspects of magazines and publishing. We gave the students a guided tour of Simpson’s conception in 2012, its birth in 2013 and its steady growth ever since. We talked about how the magazine is an expression of our passion for cycling, design and print journalism. We told them how Simpson has become a platform for emerging photographic and journalistic talent. We explained how our independence has enabled us to steer clear of the product-pushing clichés of some other publications we could mention. We shared our excitement about the opportunities Simpson has given us – to travel to places we’d never otherwise go to and meet people we’d never otherwise meet. We also talked about the growth of something bigger than just the printed magazine. We talked about our online presence, the Simpson team, the kit, T-shirts and other merchandise, the club rides and, perhaps most importantly, the sense of community and shared purpose that’s gradually formed around the Simpson name. Delivering this talk served to remind us how far we’ve come in the last few years. It encouraged us to step back from the day-to-day plate-juggling exercise of work and family and cycling and everything else, just for a few hours, to reflect on how fulfilling it’s been and how lucky we are to be involved in the wonderful world of Simpson. Whether it's the most eagerly awaited public holiday of the year is another topic for debate but the Christmas period for cyclists is a mixed blessing. Like all public holidays the same amount of work is compacted into fewer days leaving us having to write off a day in order to catch up on sleep. Traditionally a time for family get togethers, of giving, receiving, of sharing and an excuse for overindulgence Christmas is a strange bedfellow. Thanks to the changes in the jet stream the only snow we now see at this time is found on greetings cards. You can safely say that, at least in the UK, Christmas Day will be mild, damp affair with a flat greyness to it. A perfect climate to try out all your new cycling related presents but shouldn't you be at hand to help with reading user manuals, topping up sherry glasses and making sure the children's new toys have there batteries fitted correctly - what do you? The irony of it all lies, in part, in the temptation to over do things on the food & drink front. With every combination on the menu from gastro finger food to the traditional three bird roast it's difficult to retain any restraint. The same goes with alcohol consumption. The time you've spent finding the lightest frame/saddle/groupset/handlebars etc. those precious gram saving present ideas all go to waste as you pile the pounds on. Any benefits now lie in ruins. Our perspective is that you have to earn your freedom to cycle, create an environment where Aunt Vi enquires why you haven't been out for a ride yet. Be a martyr, be seen to abstain, refuse that extra mince pie, sausage roll and can of beer - publicly be seen to suffer for your cycling. At the end of the day it's all down to the individual as to how your Christmas pans out with your cycling. You're the one that needs to find the right balance between family and self at this time but from all at Simpson magazine we would like to take this opportunity to wish you a very Merry Christmas and a Happy healthy 2017.